Q: What is National Neighborhood Watch? Q: What is the National Sheriffs' Association role in the National Neighborhood Watch program? A: The National Sheriffs' Association is the founder of the National Neighborhood Watch program, serves as the primary contact, and oversees the program. We invite you to learn more about the National Sheriffs' Association online. Q: Is the National Sheriffs' Association a government agency? A: No. The National Sheriffs' Association is non-profit organization dedicated to raising the level of professionalism among those in the criminal justice field. Q: Where do I find Neighborhood Watch Products such as Signs? A: There are a number of vendors that offer neighborhood watch products online. You can also check with your local law enforcement, as they may have signs available. Q: Can I use the logo's for my watch group? A: Interested in using one of the trademarked NSA logo’s for your watch group, you must apply through our logo permissions process. NSA would also be happy to work with you if it is for a particular event or activity in your town. To learn more about our logo process please visit www.sheriffs.org or view our policy. Q: How do I start a Neighborhood Watch? A: To begin a NW, merely form a small planning committee of neighbors to discuss the needs of your community, gauge the level of interest and potential problems, decide on a date and place for an initial Neighborhood Watch meeting, and contact your local police department or sheriff's office, and notify them of your interest to start a NW. You will then be assigned a crime prevention officer who will attend your first meeting. It's that simple. 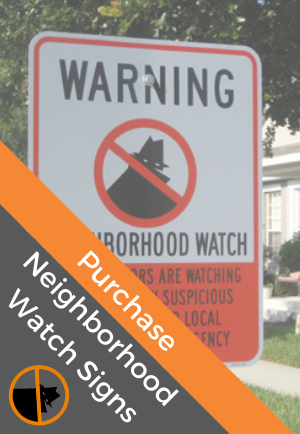 For more information and educational materials related to starting a Neighborhood Watch or to register your Neighborhood Watch in the National Neighborhood Watch Database, click onto the Register / Start Watch on this website. Q: How do I join a Neighborhood Watch in my community? A: First, search the National NW database to find your local law enforcement agency, and call to find out if there is a Neighborhood Watch in your neighborhood. If there is a Neighborhood Watch in your neighborhood, simply attend a meeting and sign up to volunteer. If there is not Neighborhood Watch in your neighborhood, talk with your local law enforcement agency about starting a new NW. Q: What are the criteria for starting a Neighborhood Watch? A: In order to create a Neighborhood Watch in your community, you must have established a partnership with a law enforcement agency. For information on the criteria for starting a NW, go to the Resource Center on this website. Q: Who can participate in a Neighborhood Watch? A: Members of local communities and representatives from businesses, government agencies, and a variety of organizations can participate in a Neighborhood Watch once they have established a partnership with their local law enforcement agency. Q: Who trains neighborhood watch volunteers? A: A crime prevention officer assigned by your local police department or sheriff's office supplies initial training of volunteers. In addition, you will find all of the materials you will need on starting and operating a Neighborhood Watch on this website. Q: Where do I obtain materials to start a Neighborhood Watch? A: Materials that can aid you in starting a Neighborhood Watch can be downloaded from the Resource Center located on this website. Q: Can businesses or corporations start Neighborhood Watches? A: Yes. For more details, visit our Resource Center. You may also contact the National Sheriffs' Association at (703) 836-7827 or email nw@sheriffs.org. Q: Can I reproduce textual materials I find on NationalNeighborhoodWatch.org? Yes, as long as you are distributing these materials in a medium other than the Web. You are welcome to use these materials in handouts or newsletters, for example. The following rules apply to reproduction of National Neighborhood Watch materials: Text must not be altered. Attribution of the authors of the text must be given. Information about where additional materials can be obtained must be provided. Q: What is the difference between Citizens Patrol and Neighborhood Watch? A: Citizens Patrol is mainly groups of volunteers who donate their time to work with law enforcement departments. In some cases, Citizens Patrol is directly started and funded by law enforcement agency for the specific purpose of assisting that agency with basic functions such as providing administrative help or assisting with patrolling areas with nonviolent crimes. Neighborhood Watch is a crime prevention program that stresses education and common sense. It teaches citizens how to help themselves by identifying and reporting suspicious activity in their neighborhoods to local law enforcement. Neighborhood Watch Groups are more than the eyes and ears for police. The defining difference between Neighborhood Watch and Citizen Patrol is their evolvement with law enforcement. While both assist law enforcement their roles are different. Neighborhood Watch reports suspicious activity in their neighborhood to law enforcement. Citizen Patrol works closely with law enforcement to assist their efforts. Q: Can my group be held liable for civil or criminal infractions? Q: How can I link to the National Neighborhood Watch Website? A: National Neighborhood Watch invites links to our website. We encourage you to visit our terms and conditions for linking Page. Q: Can I use the National Neighborhood Watch logo? A: For information on the use of the National Neighborhood Watch logo, please click on Link to Us at the bottom of this page or contact us by email. Q: Can I put a National Neighborhood Watch ad banner on my Website? A: For information on banner ads, please click on Link to Us at the bottom of this page, or contact us by email.